The form I am looking for is the waiver of the service of process for Pinellas County Florida. I don't understand why the Florida courts have not published a generic waiver of service form yet. The vast majority of Pro Se litigants using these forms are for uncontested procedures. The last thing a respondent wants is the sheriffs department showing up at their homes or their places of work to serve process on papers where there is no disagreement. I have not found a local form for Pinellas, but you can use the format below to craft your own waiver. You can copy and paste to your favorite word processor. We've used this format before for our customers statewide, with no complaints. If you have any problems, please let us know. the respondent should sign and notarize, and then file the form with the clerk of the court. 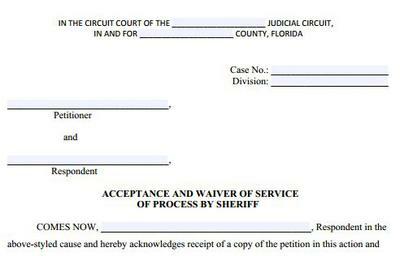 COMES NOW, ___________________________________________, Respondent in the above-styled cause and hereby acknowledges receipt of a copy of the petition in this action and in doing so accepts service of same and specifically waives formal service of process by Sheriff or other person duly authorized to serve process in the State of Florida. Dated this _________ day of __________ 20 ____. You can copy and paste the above into your favorite word processor or text editor. Be sure it is properly formatted before you print it out. Return to Ask the Staff 2015.